This Facebook status called “Conversation with an anti-vaxxer” was recently brought up to us. We were asked for our input, and we had plenty to offer. This is obviously a “gotcha”, “I’ve done my research” post. We found that very poor research had been done here, and it needed to be corrected. The original text is in BOLD RED. Q: So you’re an “anti-vaxxer“? A: Yes, if you need to call me that. Q: Don’t you worry about your child getting sick from vaccine preventable diseases? A: No, not really. I actually have less fear of many of those illnesses now that I’ve done my research. Whooping Cough: Pneumonia, convulsions, encephalitis, death. Mumps:Deafness, encephalitis, infertility in men. Chicken Pox: Pneumonia, Toxic Shock Syndrome, Bacterial Infections, Death. Q: But what about polio? A: Polio is asymptomatic in over 90% of cases. When symptoms do present, they’re usually mild and flu-like. Up to 72% of cases are asymptomatic. 1% will get paralytic polio. Before the vaccine 13,000-20,000 cases of paralytic polio were reported annually. We’ve addressed other Polio Myths, here. Q: But we don’t see iron lungs anymore because of vaccines. A: We don’t see iron lungs anymore for the same reason we don’t see computers that are large enough to take up an entire room. Technology has come a long way. True, we have ventilators now. Though the iron lung allowed individuals to not be intubated for long periods of time (the rest of their lives sometimes). These type of individuals are now given tracheotomies and portable ventilators. Q: But even if the risk of getting something serious is small, don’t you want to protect your child with vaccines just in case? A: I do want to protect my child, and that is one reason I say no to vaccines. Because in my cost-benefit analysis (what? ), the chances of my child being harmed from vaccines is greater than the chances of my child being harmed from one of those illnesses. We know serious adverse events from vaccines are extremely rare. Measles alone has an encephalitis risk of 1 in 1,000, and death rate of 1 in 5,000, it can cause deafness, blindness, and even years later it carries a 1 in 25,000 chance of 100% fatal subacute sclerosing panencephalitis (SSPE). Q: But it’s not just about your child. It is your responsibility to vaccinate your child to protect immune compromised people through herd immunity. A: First and foremost, my responsibility is to my child. I will not set my child on fire to keep someone else warm. What parent would knowingly risk their child’s life for the sake of the herd? Would you? My child is not a human shield. Secondly, herd immunity is a myth. 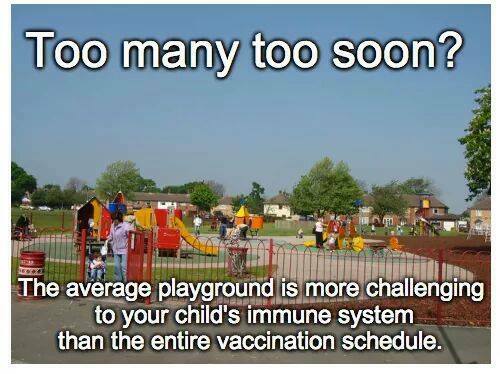 We do not have vaccine induced herd immunity and never have. Vaccination is by far less risky for your child than acquiring natural infection. The analogy here is an example of false equivalency, and is extremely dramatic. Herd immunity is not a myth, it is a well-demonstrated fact. Q: But don’t you think vaccines are a victim of their own success? They eradicated polio and other diseases, so you probably haven’t seen them thanks to vaccines. A: Correlation does not equal causation. This person doesn’t understand what “correlation does not equal causation” means. You will see in the text that follows, that this person uses the argument that correlation does equal causation, when it comes to the rise in different health conditions. So they believe correlation equals causation, but only when they want it to. The history of vaccines is more complex than that, and I no longer believe that vaccines can take the credit for eradicating any diseases. If you believe the above statement you are committing to belief in a mass conspiracy, and your head is firmly in the sand. We have never had widespread vaccination for scarlet fever or typhoid yet, they are no longer a threat. Scarlet fever is a secondary infection to strep throat; we have antibiotics which prevent most cases now. Yes, sanitation is partially credited for the fall in Typhoid cases, but, there is a typhoid vaccine, Typhoid is still a threat around the world. Amazing what sanitation can do. Polio has also not been eradicated. I may not have lived through the “polio” era, but I am living in a time with a different kind of epidemic. Do you know what is really amazing? In 1952, 58,000 new cases of polio were reported in the United States, and more than 3,000 died from the disease. In 1955 the polio vaccine was rolled out, in 1957 the United States only had 6,000 cases of polio. Do you know what else is really amazing? Polio has been eliminated from everywhere but Pakistan and Afghanistan. It has been eliminated from places that do not have modern sanitation practices. We are so close to the eradication of polio, there was only 37 cases globally in 2016. My child’s generation is the first to have a life expectancy that is less than that of their parents. People are sicker than ever with autoimmune diseases, deadly allergies, neurological problems, and cancer (this is not related to vaccines. We can not cling to a controversial problem of the past to make crucial decisions for today. We have to do something about the problems we are currently faced with, and giving more vaccines is not an acceptable solution. This has nothing to do with vaccines. Q: Do the ingredients in vaccines concern you? The ingredients should not scare you. They are all in safe amounts, remember, the dose makes the poison. Q: You know there’s formaldehyde in pears, right? And mercury in tuna? A: When’s the last time you puréed a pear and some tuna, then injected it intramuscularly? We have a digestive system for a reason, and the mucosal tissue is one of the most important components of the human immune system. I don’t think bypassing those functions is without consequence. Ingestion and injection are not the same thing. It’s the same reason you can drink snake venom, but being bitten in the leg with the same venom can kill you. Ingestion and injection are not that different. Q: But the science is settled and doctors and scientists agree that vaccines are necessary. A: Science is never settled. As history has shown, science can be dangerously wrong. It can also be heavily influenced by financial interests. And doctors and scientists do not all agree about vaccines. If you jump off a building, will you fall or fly? Seems like the science on gravity is settled. It is true there are dishonest people out there. Andrew Wakefield was paid $500,000 to produce the results he did in his infamous MMR- Autism Study. He also holds a patent for a single dose measles vaccine he claimed is safer. There are many doctors, nurses, immunologists and researchers who are aware of the shortcomings of vaccines. And if we want to really discuss vaccine science, we need to demand that there be more of it, because vaccine science is severely lacking. The same anti-vaccine doctors are continuously cited; some are no longer licensed to practice, many have financial interests in being anti-vaccine, most have online stores where they sell supplements and books. There is one lady who has a Ph.D in immunology and is anti-vaccine, one. I’m not sure what qualifies as a researcher? There’s that one guy who communicates with aliens, and his buddy the computer scientist, is an AIDS denialist. The science behind vaccines is not lacking. Each vaccine is extensively studied for safety and efficacy. It is the tobacco science of our time. Those were advertisements, not science. The current vaccine schedule (which has more than tripled since vaccine manufacturers became protected from liability) has never been tested for safety. There hasn’t been a randomized double blind placebo controlled study comparing the outcomes of the vaccinated vs. unvaccinated. Vaccines are the epitome of quackery . The one study this lady wants doesn’t exist for a variety of reasons. Why do anti-vaxxers hate the National Vaccine Injury Compensation Program (NVICP)? How to spot a quack. It is a terrible idea to ignore facts and reality when making decisions. One of the most important vaccines we can receive to protect our unborn babies is the Tetanus, Diptheria and acellular Pertussis (Tdap) vaccine. Here’s a great video from the CDC which features pregnant mom Laura and why she chose to get the Tdap during pregnancy. Whopping cough, or pertussis, is a life-threatening disease which can cause severe respiratory complications for newborns who are too young to receive their first TDaP booster at 2 months old. The babies cough so hard and for so long that they are unable to breath properly; they gasp for breaths in between severe coughing fits which causes a “whopping” sound. Most babies who contract pertussis end up in the hospital and the cough can last up to ten weeks which is why it is often referred to as the 100 day cough. The CDC estimates that worldwide more than 195,000 deaths can be attributed to pertussis each year. Here is a video from the Mayo Clinic of a baby with whopping cough. This may be upsetting to some. Getting the Tdap vaccine during your third trimester (27-36 weeks) of each pregnancy is important because it ensures that you will pass the antibodies you have developed against pertussis to your unborn baby so that he/she is protected until they are old enough for their first of three DTaP boosters at 2 months, 4 months and 6 months. Your baby will also receive boosters later on at 15-18 months and also at 4-6 years old. Some people wonder why they get a Tdap vaccine and their babies get a DTaP vaccine. The vaccine for babies contains 3-5x the amount of the toxoid (the bacteria) so that the baby makes a strong immune response. To distinguish the stronger dose from the lesser dose, uppercase letters are used. Since adults have already received their initial DTaP vaccines when they were children, they only need their Tdap boosters in pregnancy. Light for Riley is a foundation which started in 2015 after Australian infant Riley Hughes lost his life to whooping cough after just 32 days of life. His mother, Catherine Hughes, has raised awareness in Australia and the world about the importance of getting the Tdap vaccine during the third trimester of pregnancy. Before Riley’s death, the Tdap booster in the third trimester was not offered for free in Australia. Thanks to Catherine Hughes’ advocacy, each state in Australia now provides the Tdap booster in the third month of pregnancy for free. Some people choose not to vaccinate their children which has led to some public health outbreaks of pertussis. The best way to protect yourself and your family is to get the Tdap vaccine during the third trimester of pregnancy and to ensure that all adults who will come into contact with your newborn get their Tdap booster. In 2012, the most recent peak year, 48,277 cases of pertussis were reported in the United States, but many more go undiagnosed and unreported. This is the largest number of cases reported in the United States since 1955 when 62,786 cases were reported. Whooping cough can be life-threatening for babies who are less than a year old. And they’re most likely to catch the disease from household members and other close contacts who might not even know they’re infected. 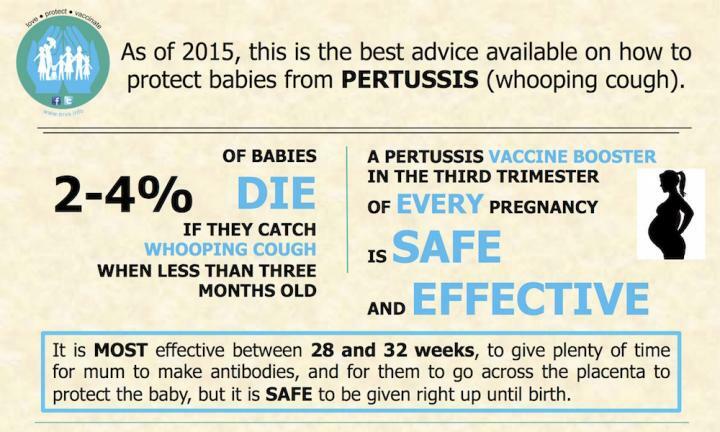 So vaccinating adults and adolescents against whooping cough also helps protect babies from the disease. I thank God I fell down on the side of science. I thank God we didn’t miss our two-month appointment, or decide Blaise could wait on a TDaP. I never saw my son turn blue from coughing; I never saw my son unable to catch his breath. He’d have been hospitalized, at the very least, and subject to all the IVs and aspirators and nebulizers they had to shove at him. My precious, perfect son could have cracked a rib, could have started asthma attacks and damaged his pretty pink lungs already, at 4 months old. He could have been sick beyond belief. But he didn’t. He wasn’t. All because of one small shot that saved him so much pain. Of the sick infants whose mothers did not get the vaccination, known as Tdap (which protects against tetanus, diphtheria and pertussis), three out of four (77 percent) were hospitalized, according to the study. Less than half (44 percent) of those whose mothers did get the Tdap ended up in the hospital. Australia: Whooping Cough: Why are We Having Outbreaks? In this outbreak, pertussis cases among unvaccinated children represented an earlier spread of disease across local areas. Controlling outbreaks may require attention to the composition and location of the unvaccinated.